Summer has been my inspiration lately. Summer makes me think, flip flops and open toed shoes! 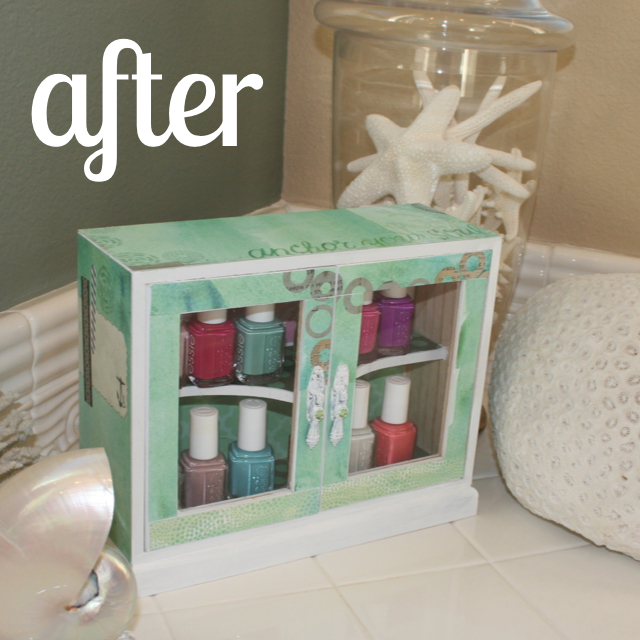 I found an adorable mini cabinet at Hobby Lobby and thought, what a great little cabinet to display all my nail polish! The first thing I did was tape off the glass and then spray painted the cabinet. I like to use spray paint, it dries faster and goes on super quick. After the cabinet dried, I used Mod Podge to add strips of my favorite papers. I chose to work with my favorite mambi paper pad, and, lucky me, all the papers are already coordinated for me. Simple as painting the cabinet and adding the beautiful paper, now I just need to add nail polish! Love this little display cabinet in my bathroom. Why tuck away all those cute colors? Happy nail painting and happy summer!